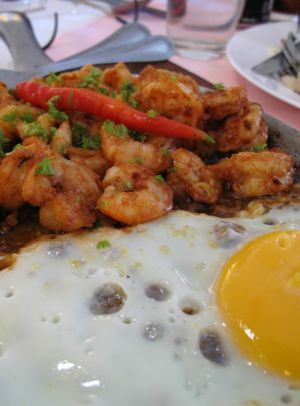 We had two dishes of sizzling gambas served with fried egg. I must say, these were the most generous servings of gambas I have ever had at a restaurant. And they were good! 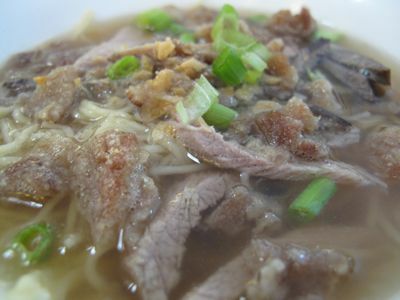 And how could we resist a few bowls of batchoy, which were very satisfying as well, but I must say that I enjoyed the batchoy at 21 more. We also had a dish of pancit “efuven,” with bits of liver and some vegetables, served with kalamansi… It was deceptively light in feel, but I suspect it still packed a caloric punch. I have to add this on my “must have” list when we visit Bacolod. That pansit efuvin looks really good! On my last trip there I got several tubs of the dulce de leche from Silay. Yummy! We spent quite a sum shopping at Pendy’s while waiting for our orders of Angus Beef Tapa, ensaimada, and Half-Moon Cake, all of which were yummy and definitely worth going back for. i love their napoleones! so looking forward to my Bacolod trip this April! thanks for the post mm. i cringed at the open faced sandwich though! brought back memories of terrible grade school cafeteria fare. ugh. gambas looks good and generous serving indeed! Pendy’s is my last stop before I go back to Manila. 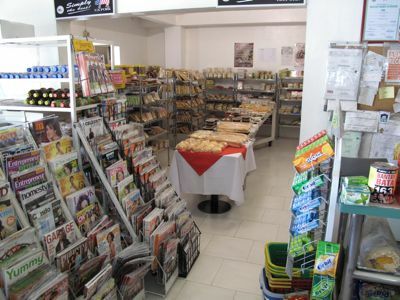 I always stock up on goodies there especially dulce gatas which is my favorite. The staff is always efficient and know us already by name. yep, when it comes to good food, Pendy’s is a Bacolod institution! Try Calea for their cakes the next time you visit. I’m just not sure if they’re still at their old place beside the L’Fisher Hotel though. the pancit efuven looks so appetizing.. hmmm.. i love all kinds of pansit..also the gambas look so good..yumm! I’m not into piaya but the crispy/crunchy piaya they sell in Pendy’s is addicting! 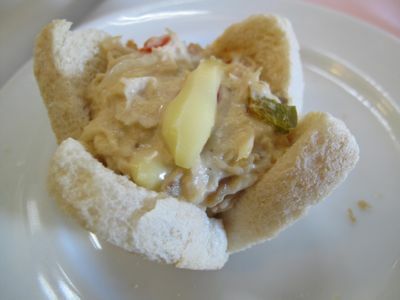 Like their presentation of open-faced chicken salad sandwich looks like a tulip flower. The gambas looked awesome! Marketman, nice blog! I sent you a PM. We are looking to open a branch of our kitchenware chain in Manila in 2009 and are looking for franchise candidates. Hopefully we can sell you some copper pans for that Viking 6-burner. I will be in Manila from April 15-17 and would like to meet up if you have time. 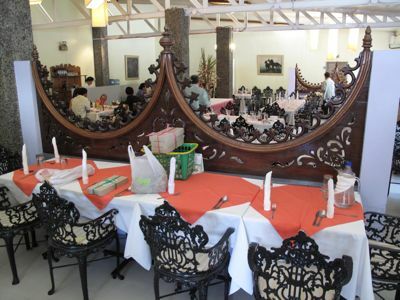 Some trivia: the gothic carved wood “dividers” came from my grandparents old Hotel Mallorca (formerly on Rizal/Locsin Sts). semikewl, if those dividers came from your grandparent’s house, you must belong to the Alonso family who used to own Hotel Mallorca. Yes I do via my mother. hi! have you guys ever tried the dulce gatas from a cow’s milk at pendy’s? it’s the best!!! yumyum! fried neurons, that is EXACTLY what it was! Holy! That is one of the first things I learned (chicken ala king in patty shells) in 19 kopong kopong ( no offense, Mrs. Anton…and I can’t ever forget your generosity in providing lunches for me) when I was 12 or 11 years old. We made patty shells using sliced bread and put it in muffin tins. I still do that until now. OLD HABITS NEVER DIE!!!! betty q, you said it. that’s how they taught us to do chicken ala king as well during high school cooking class. lol. hi MM!!!! the gambas looks good and nakakagutom…..shrimps is really my favorite….do you happen to have a recipe of gambas MM? 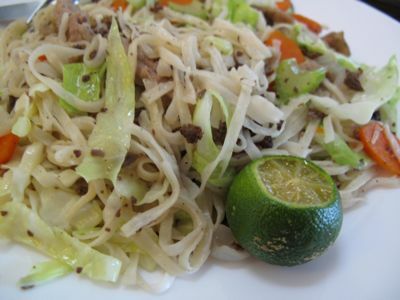 bettyq, can you share your chicken ala king recipe………tanx…..
does anybody have a recipe of pancit â€œefuven”.? It looks so light but I may have to replace the liver with something else so my wife and kids will eat it. MM, is chicken ala king not found/popular in the Manila food scene? It seemed everyone i know in bacolod knows how a chicken ala king looks like… and yes, that is a staple at office parties and when we were children… but does this mean that such product is already a remnant of “old” food in bacolod (60s boom time)? you’re right, it’s like betty crocker 1960s served in a 21st century provincial resto… same goes for Bob’s Sate Babe…. also for Chicken Asparagus, and Chicken Hawaiian… Nora Daza Redux. and.. the Chicken Cacciatore of Pendy’s… yum. lamayo? i will be in the philippines on april 19th so i thought i’ll buy some to take back with me. i am only staying there for a week so i will be able to buy this dried fish that i heard so much about. thanks, mm. Hi Betty Q. You can update the chicken ala king by putting the chicken in wonton wrappers after you bake them in small pastry molds, diba? Mas marami kang makakain kasi parang aperitif. I saw my best friend a week back and I told her we had better take a trip back to Bacolod like we used to. (Her mom side is from the Aranetas). We will find time to visit and eat at Pendy’s and 21…and look up all the food that have left me salivating. Gee I want to try that half moon and dulce de leche…the gambas look so good…I want to try that when the Holy Week is over and seafoods are no longer as expensive as now..hahaha. Blessed Holy Week to all!! P.s. bettyq,we have long holidays and I stocked up on my baking stuff so I can bake …wheeee….to the kitchen. Have been so busy lately…I miss my baking/cooking. I have some of your and MM recipes on line-up which I will do. the gambas looks sooooo yummy…. that pacit reminds me of pancit tisoy, so pale and innocent looking but tastes like chicharon, sin and garlic. yummmmmm! Love your blogs! Bacolod is my 2nd home and you’re blogs make me miss it even more. I love Pendy’s! I must go place. They have everything you want to bring home. Their half-moon cake is to die for and their lumpia. Yum! They have chicken diniguan, their angus tapa, too. I love most of the stuff they serve :D Pancit efuven is also popular in Iloilo and takes the place of the usual pancit and stuff during occassions. I call it when pancit and chopsuey marry. Wow, nakakagutom! I miss bacolod, the people, food, and everything! For tourist, travellers, traders Go Bacolod! aside from pendy’s goodies, guys u can also try the cakes from Bob’s at 18th street when u come to bacolod .their chocolate cake is soooo.. super moist & their carrot cake is so yummy.. perfect.my son loves it very much !.bar 21 along lacson street is also a fine place to dine.their baby back ribs is so good. I eat the Gambas every time I go there, it is the best I have ever had, I strongly recomend it to anyone. Pendy’s is one of my favorite restaurants in Bacolod. I’m from bacolod and my family usually eat here often. The food we always order here is their SPARERIBS! Very very delicious and yummy! When you have time, visit Pendy’s and order their spareribs. For sure, you will never regret it. The Next Porky Challenge : Chicharon a la Marketman!! !